On bookstore shelves today (I hope) is something I’ve been toiling over for the past few months. 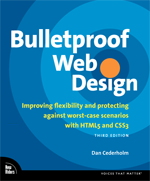 Bulletproof Web Design, Second Edition is a refresh of the book I wrote for New Riders in 2005. I’ve been humbled by the response of the first edition, and have enjoyed talking about the principles described in the book at conferences and workshops over the last few years. So it was only fitting to give this little blue book a tune-up under the hood. This isn’t a giant update nor a new book entirely. Rather, it brings the examples in line with Internet Explorer 7 (which wasn’t released when the first ed. was published) and adds several more examples based on ems (which were sorely lacking from the original book). There are of course errata fixes and nips and tucks throughout as well, and about 30 additional pages were added in total. All in all, I’m happy to have the book be all the more solid and relevant. On the surface, writing a second edition of a book seems like an easy little project. One that won’t be too much work, won’t take long, and can easily fit in between other activities. But it’s not like that. It’s like writing another book all over again (even though it’s not another book and a large portion of the text is the same). I find the actual writing of a book the easiest of all stages. It’s the editing, the back-and-forth, the endless checking and double-checking of Word docs (Word!) and then PDF files. Reading comments, checking comments, adding your own comments. “Should this be bold or code font?”. All of this is necessary of course. But my goodness it’s just as time consuming as the first go-around. But like anything that takes time and effort in life, you quickly forget the pain and maybe even someday agree to do it all over again. While today is the official publication date, Amazon is still taking pre-orders only. I’ve yet to see an actual copy myself, so there could very well be a slight delay.